A few years ago, the cheese-starved inhabitants of Crystal Palace, South London, only had a dismal branch of Morrisons in which to buy their fromages. It was a sorry state of affairs – anaemic cheddar and Edam, and not a lot else besides, sold under fluorescent strip lights. But then, lo! Rescue came in the form of a lady called Dawn and her beautiful vintage Citroen van converted into a cheese-selling wagon called The Cheese Box. Every weekend, Sarf Londoners would queue up to buy quirky independent brands of British cheeses from Dawn in the car park of Crystal Palace’s vintage Collector’s Market. I became seriously addicted to wonderful sheep and goat’s milk cheeses that made the roof of my mouth sing. But then, sadly, Dawn and her small van disappeared off the face of the earth. Crystal Palace cheese lovers were left bereft, mourning the loss of interesting varieties such as Sussex Slipcote, Rachel Goat and Keen’s Extra Mature Cheddar. I heard on the grapevine that Dawn had escaped London and moved to the seaside. But nobody knew exactly where. Then last weekend I found the reincarnation of the old van in Whitstable, Kent. Hurrah! 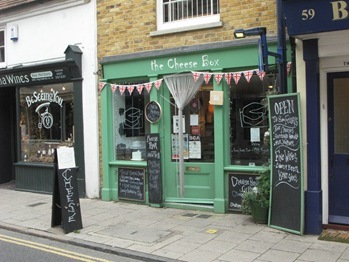 I was delighted to find The Cheese Box had transformed itself into a very charming traditional cheesemongers, co-run by Dawn and the very friendly Tom. 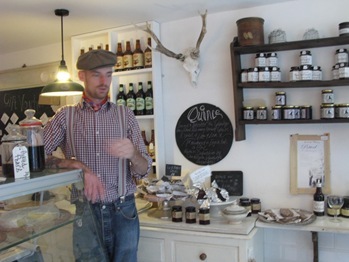 It is such a lovely shop – cheeses are temptingly displayed within throwing distance of Kentish ciders and Whitstable-produced pickles, rustic breads nestle in old wooden crates and blues music plays on the stereogram. You can pull up a chair and have a plate of cheeses and a glass of wine. It’s hard to tear oneself away. 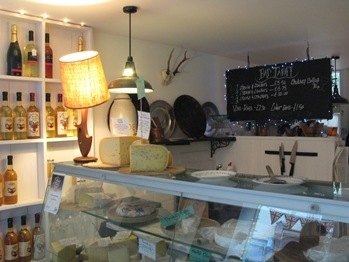 If you happen to be spending a day by the sea in Whitstable, you could do much worse than pop in to see Dawn and Tom, try a few cheeses that have big personalities and perhaps pick up some interesting ciders. Who would have known that we Brits could make such good fromage, eh? 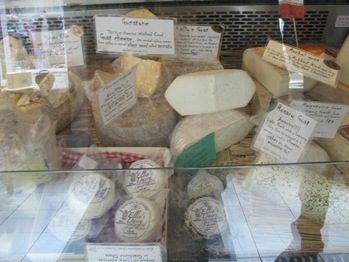 Dawn and Tom have sussed out some of the best independent producers in the Kentish area and beyond. Beats buying shrink-wrapped soapy slabs of mild cheddar in the supermarket any day. Oh – and they deliver, which means that there is possible salvation for the inhabitants of Crystal Palace…because even though we now have a Sainsbury’s, it’s not quite the same thing, is it? That makes me so hungry. And Tom looks super cool. Can he be our friend? Please?